Quibble Coinbiter's Frostval Rares are here! Grab the Coolest Gear of the Year This Weekend! Past, present, and future Frostval items freeze the insides of Quibble Coinbiter's pack... and YOUR inventory! AQWorlds' very own time-traveling sales moglin is in Battleon NOW with gear from across space AND time! But he won't be there long, so you'll want to dig through his chest of never-before-seen-slightly-used items and rares while you can! 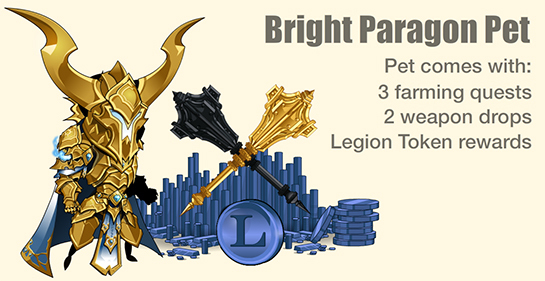 Find the Bright Paragon Pet in Quibble's shop tonight! This blindingly-brilliant pet comes with 3 quests - 1 for ALL players with 2 weapon rewards, and 2 quests exclusively for Undead Legion members! The Legion quests reward a ton of Legion Tokens and thanks to fellow AQW player sudz16's suggestion, will soon drop a Legion Token Pile house item, too! 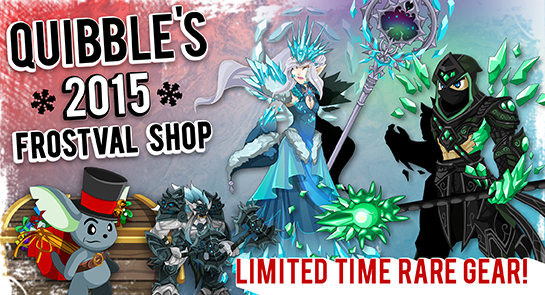 This is the first update to Quibble's 2015 Frostval Shop - check back next week, when he'll have even MORE gear to chill and thrill you with!